When looking for a romantic gift that will be cherished and loved for years to come, our brilliant round pave Diamond sapphire halo pendant is a perfect choice. 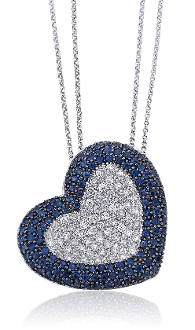 This puffed heart pendant is masterfully crafted; encrusted with 1.25 Carat t.w. shimmering Diamonds in the center and outlined with striking high quality, genuine sapphires set with black gold prongs. Designed in highly polished 14 Karat white gold, the setting features an intricate open worked honeycomb design on the reverse. This fashion forward slide pendant comes complete with a 16 inch double stranded cable-chain and all secures with a high quality lobster claw clasp.